So once a week or so I'll post an outfit on Facebook for my friends and family. It's kinda fun, because I love style bloggers but have a hard time doing the big "outfit post" thing. So I just overindulge in selfies. 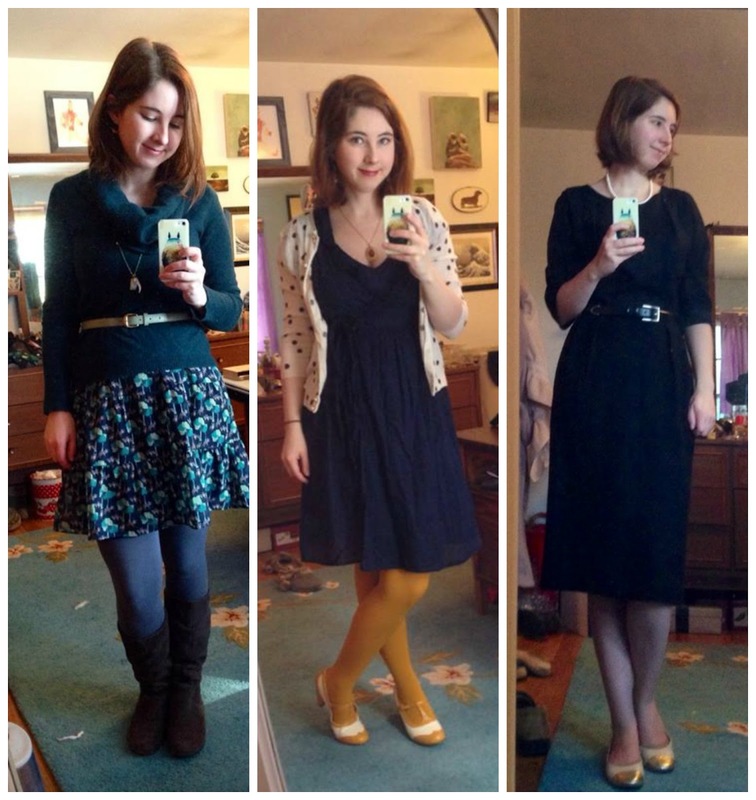 One thing it's great for, though, is to recap what my style was like this past fall/winter. I thought I'd do a little post here collecting all of my selfies from October to mid-March and maybe look back on it next fall. I collect cardigans like they're going to disappear off the face of the planet. 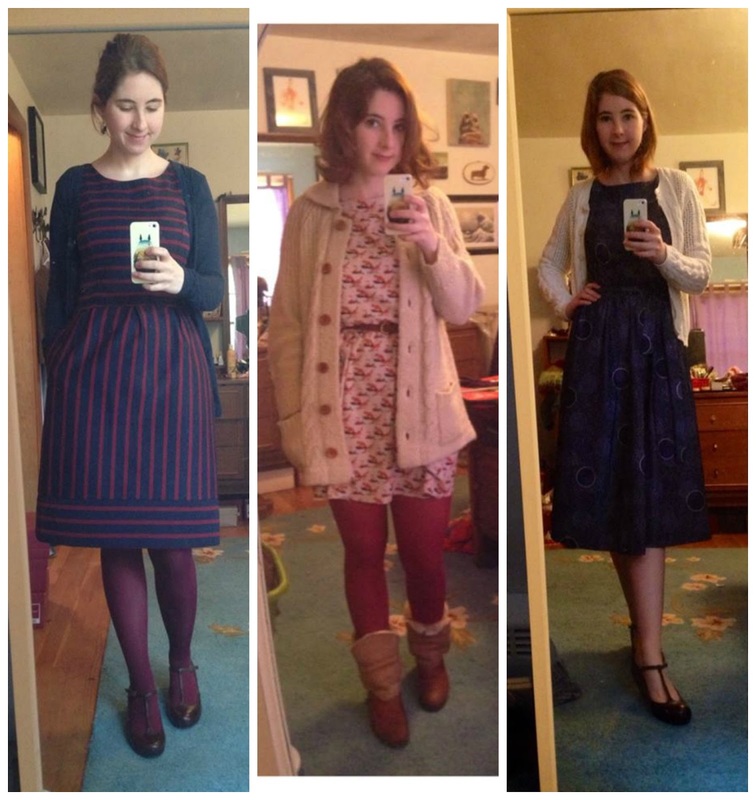 I tend to wear a lot of dresses with cardigans and tights - I think this turns them into immediate winter-wear. The dress on the left is from Target, the one in the middle is a fox print dress from Ebay, and the one on the right is a 1970s polka dot dress. The middle cardigan is for sale in my etsy shop. It's so warm and cute. I wear my fair share of pants, especially when the wind chill is below 20 degrees (which is most of the time from January to the end of February). 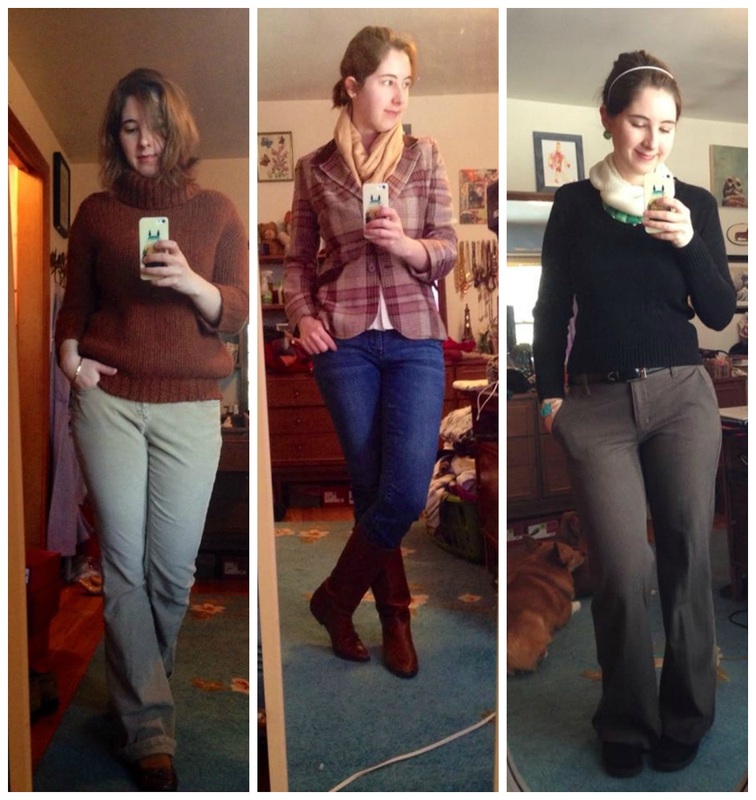 In the middle photo I'm wearing my favorite vintage Etienne Aigner leather riding boots, and a vintage blazer I picked up at the Davis Flea. In the right photo I've got on a great vintage blouse that has a neck that looks kind of like a ...peter pan style cowl? It's neat, and I love it under sweaters. 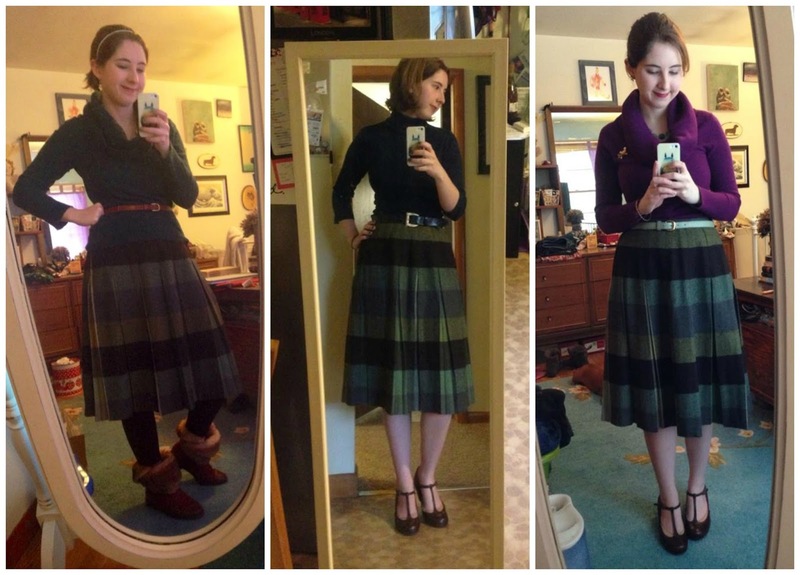 This vintage skirt I had listed in the Etsy Shop but had to take it out... I just love it too much. The teal and brown combo goes with so many things. I found two matching Banana Republic wool cowl-neck sweaters at thrift stores this year and they are so warm and comfy (left and right photo). This last set of photos includes a vintage wool L'aiglon dress I bought on Etsy this year and had to do a lot of repairs to (very loose woven wool that had developed a number of holes). 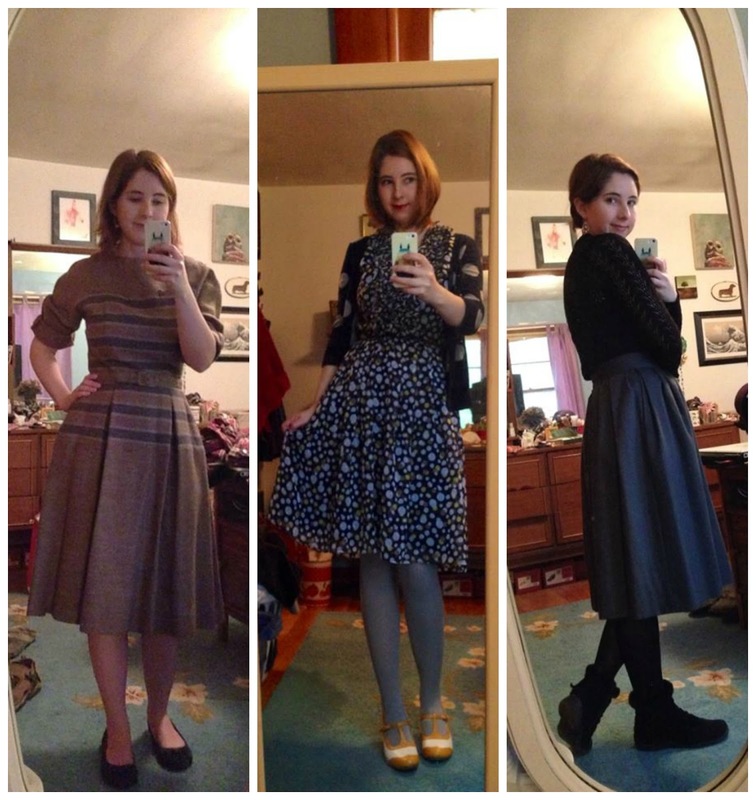 The middle is a polka dot dress from Adriana Pappell (one of my favorite modern ready-to-wear designers) and the right is a vintage pointelle sweater and a gray dirndl skirt from the 1970s that is one of my new favorite things in the world. Well that's it... for now!